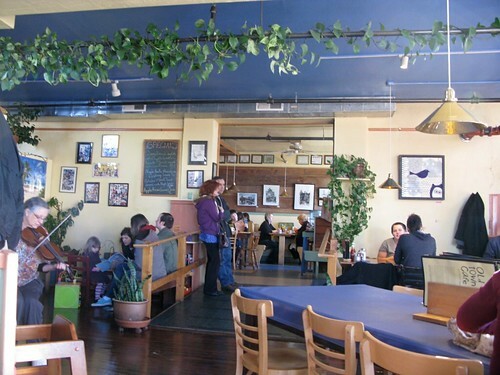 A few days ago, while eating brunch at the Old Town Cafe in Bellingham, Washington, it occurred to me: if I were going to tell a non-American how to best experience American food culture, the meal I’d suggest (and this is a brand new revelation) is breakfast. Think about it: where are Americans more cheerful? More themselves? Where is the mood more exuberant, where do we wait in line without complaining, cradling mugfuls of complimentary coffee? When else does the sun beat through the window at lovely angles, the smell of hot pastries fill the air? When else is it ok to have a sticky menu? To have a waiter with matted bed-head? It’s at breakfast and some of my favorite restaurants in the U.S.–the Flying Biscuit in Atlanta, Glo’s in Seattle, Prune in New York–are (with the exception of Prune) primarily brunch spots. 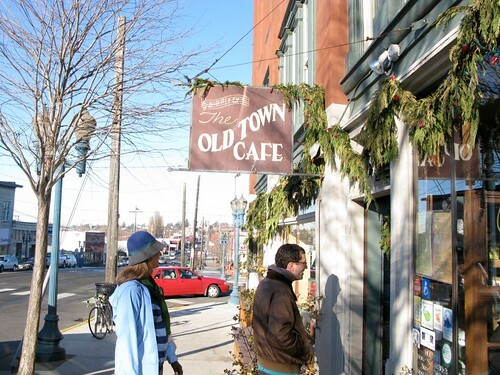 Now I have a new one to add to the roster: the Old Town Cafe. Bellingham, Washington, as many of you know, is where Craig’s family lives. (See here.) Every time we go to Bellingham to visit Craig’s family for Christmas, I make him take me to breakfast at the Harris Street Cafe in Old Fairhaven, the adorable Christmas card of a village right near his family’s house. 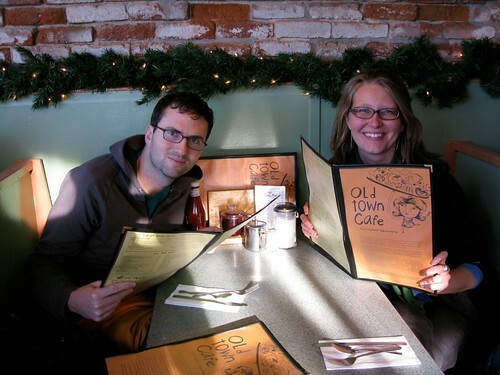 This time, after knocking Harris Street out on our first day there, we discovered a new brunch spot with his friend Ellen: the Old Town Cafe. 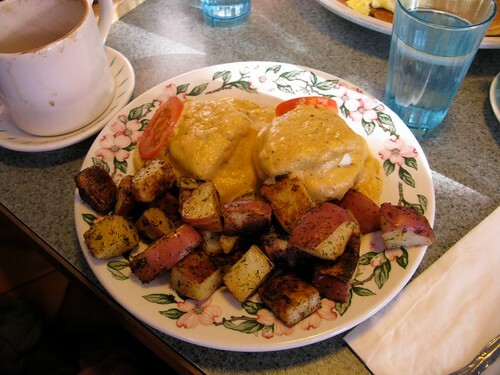 The Old Town Cafe would be a terrific place for a non-American to experience the phenomenon of the American breakfast. 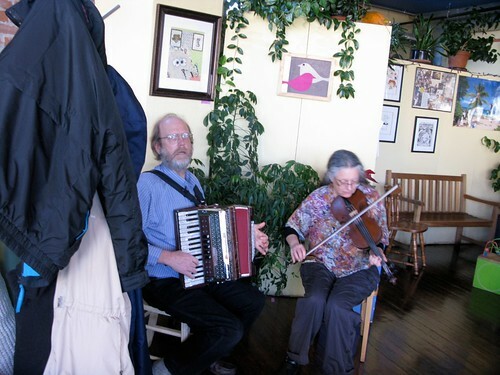 You get the hustle and bustle of a diner but with far better food, eccentric waiters in eccentric t-shirts, and–the pièce de résistance: a duo playing accordion and fiddle. Here’s the place itself. Do you see what I mean? Aren’t there places like this all over America but only in America? I’ve never seen anything like them in France, Spain or Italy. 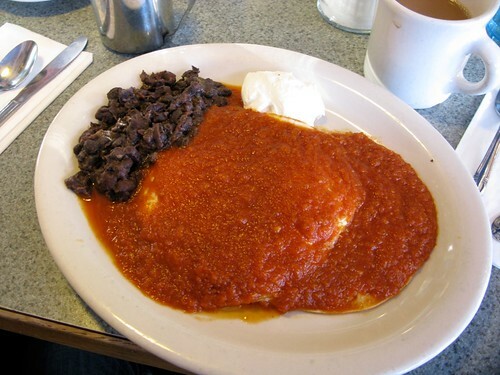 As for me, I ordered something that is not at all American, but a staple of American brunch menus nonetheless: huevos rancheros. The fact that I ordered these doesn’t undermine my point, it highlights one of the best things about America via the American breakfast: we’re a melting pot! Look how that chipotle sauce melts over the tortillas and eggs the way that various cultures melt into the beating heart of the American populous. Inspiring! My coffee mug? ‘Twas overflowing. My water glass? I had to refill it myself from a self-help water station. But so what? 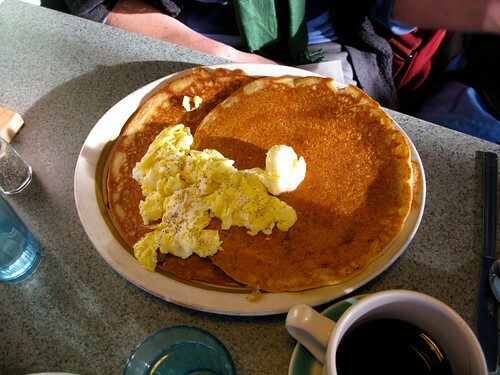 This is the spirit of breakfast, the spirit of America, right here at the Old Town Cafe. So, if you’re visiting America for the first time and reading guidebooks that suggest four star restaurants like Jean-Georges and Daniel, you do yourself a disservice to dismiss American dining at its most lovable, the dining you experience when you go out for breakfast. 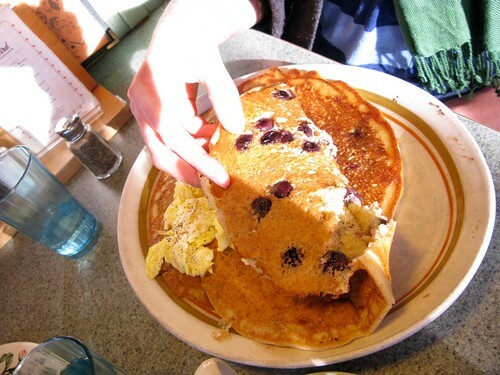 Diana’s Italian friend has it right: to miss American food is to miss the American breakfast. It’s one of the things our country does best. Why Do We Pay So Much For Breakfast Food? The Skeleton Twins Trailer Is Here!